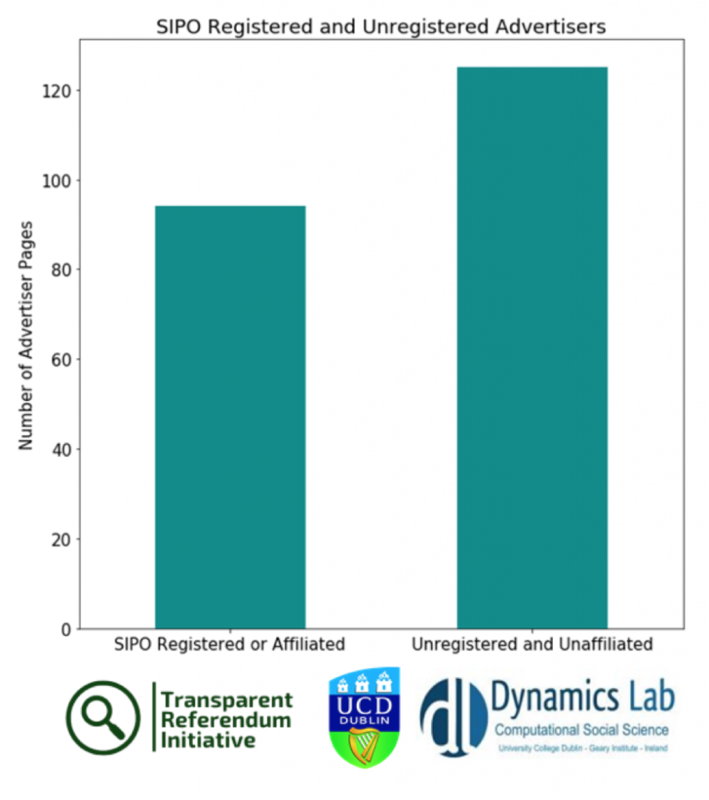 Analysis of Facebook ads related to the Referendum on the 8th Amendment was released by the Transparent Referendum Initiative (TRef) last week highlighting problems with regulation and transparency of digital marketing in Irish elections. TRef is an independent voluntary initiative aiming to shed light on Referendum related adverts placed on Facebook. Responding to the gap in regulation that leaves little to no oversight of advertising on social media, it called for evidence-based reform of electoral spending rules and for the release of information held by social media organisations. What is the evidence and what does it tell us? While over the past few weeks there were many examples of problematic adverts, this is the first time that the problem has been scaled . 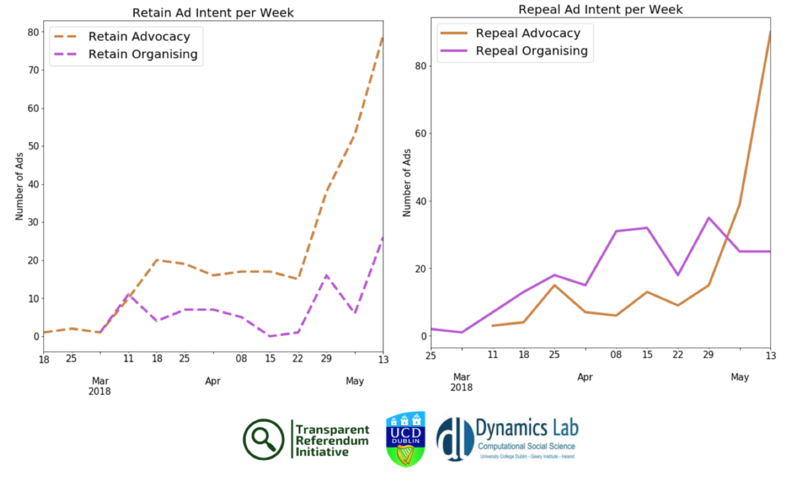 An analysis over time shows that the number of ads placed by both campaigns increasing sharply since the end of April, with slightly more advertising coming from pro-repeal campaign groups than pro-retain. In the past week, more than 230 new ads alone were captured. Most of the advertisers captured in the database, 57%, were not registered or associated to groups registered with the Standards in Public Office Commission (SIPO) Ireland’s electoral spending regulator. Only 43% of advertisers were registered or affiliated with SIPO. With such a large potion of advertisers outside the reach of the regulator it highlights a sizable gap in Ireland’s electoral advertising oversight. TRef’s analysis also illustrates the extent of overseas and untraceable advertising up to the of Facebook’s policy changes on May 8th. It shows that 90% of ads were from organisations or individuals based in Ireland, 5% were from overseas and 5% were untraceable. While only Facebook knows the true extent of obscure or overseas advertising, this indicates that the social media giant stood to lose 5% – 10% of advertisers from the foreign ads ban. However, it is not yet clear how much this corresponds to in lost revenue. TRef examined the advertisers that are not registered with SIPO and showed that about 18% of adverts came from overseas, while just over 10% were not traceable. The group also found several advertisers representing themselves as objective or neutral in the campaign but were, in fact, advocating for one side or another. Seven campaign advertisers posting 28 ads under the guise of neutrality were identified. The ads take two distinct forms ‘advocacy’ where a position is being championed and ‘organisation’, where campaign groups advertise events, fundraising drives and other organisational issues. The pro-repeal advertisers engaged in more organisational advertising than the pro-retain and there were fewer advocacy adverts than on the pro-retain side. This may be reflective of the broad organisational resources and campaign strategies of different groups before and during the referendum campaign. Unpacking what TRef want and want to avoid. TRef say they do not want the ability to pay to be a deciding factor in the democratic process and want Facebook and other digital advertising providers to disclose information on ads and ad spending. The initiative also identified a need to understand what is being spent by campaigners beyond ad space, such as content creation in the form of high-quality video ads. It also wants campaign groups that are advertising to be open to transparency and for campaign advertising to be open to scrutiny with misinformation being quickly addressed. The data shows that there was a high volume of non-SIPO registered advertisers which highlights a considerable lacuna in electoral campaign regulation. Campaign advertising such as broadcast adverts and electoral publications are heavily regulated, but a large portion of the population is digitally immersed and state efforts to ensure the quality of political advertising are lacking. This has been addressed in the short term by Facebook’s policy change that requires more information from advertisers, but this does not place any further requirements to oversee the quality of information or transparency about spending by campaign groups. The ability of groups and individuals outside the state to influence the democratic process is also a concern. TRef want to see some limitations on overseas advertisers. Facebook’s policy changes were both welcomed and criticised. But this policy is temporary, and it is not a one election fits all solution. Ireland’s democratic participation in general extends beyond the state border to the EU. A complete block on all overseas advertisers has its own set of problems and others that cannot be identified from one case study. But crucially, decisions on who can and cannot participate in Irish democracy should not be left up to social media companies. There are still questions that remain unanswered and the group acknowledge that the data capture process, relying on a sample of people willing to use the plugin, has some limitations. However, Facebook and Google have the data needed to more fully examine digital advertising during the Referendum campaign and TRef hope that this will be released in time. However, Facebook has made no commitments. Mark Zuckerberg when asked at the European Parliament members meeting this week to release information on Brexit and the Referendum on the 8th did not provide an answer nor indicate whether if the company was willing to release it. The nature of micro-targeting of undecided voters was raised as some target demographic factors available to advertisers are unknown, nor is how Irish people were profiled by Facebook. Polls taken over the course of the campaign show the number of undecided voters ranging from 20% in April to 14- 17% in the most recent polls and, with the potential to swing the vote one way or the other, this is a demographic of particular interest. TRef say its’ short-term ambition is to get online platforms that carried adverts to release the information about what they sold during the referendum. In the mid-term to address the issue of full transparency of on and offline advertising ahead of the next general election. And in the longer term, to advocate for a standing electoral commission that reworks the Electoral Acts with the capacity to respond to technology as it changes. At the launch of the analysis, the floor was opened to discussion with participants addressed several issues that need to be considered going forward. Among the issues that need to be further addressed is the need to tackle misinformation and the misappropriation of content from other producers such as RTE. Data harvesting and profiling of Irish users by social media companies were also raised as a concern. But there were also expressions that any regulatory changes should not be so heavy-handed as to dampen political participation. To ensure the result of Friday’s Referendum is considered to be legitimate, TRef say that social media companies need to be transparent about the campaign adverts sold. But in the meantime, the group will continue to shine a light into the darkness of digital advertising. TRef research is described as an exploratory case study. The data is collected by a sample of volunteers using the Who.Targets.Me plugin and while the sample over represents Leinster region and does not capture all of the adverts, it offers a snapshot of advertising on Facebook during the campaign. The author of this article participated in coding some of the data. This article was edited at 15.46 on 23/-5/18 from “Facebook’s and Google’s foreign ads ban were both welcomed and criticised” to “Facebook’s policy changes were both welcomed and criticised” and added an updated to include responses from the European Parliamentary meeting.